Previous Pew Research Center studies have analyzed news coverage of the beginning of each of the past four presidential administrations, starting with President Bill Clinton. During that time, the news media environment has changed dramatically, from expanded cable offerings to a cornucopia of digital news sites. At the beginning of the Obama administration in 2009, researchers examined a cross-section of the news media environment as it existed at that time while also studying how coverage from the original set of news outlets changed across administrations. In 2017, we are able to compare topic, frame and overall assessment of the president and his administration across time using the seven sampled media organizations that have persisted since 1993: the nightly evening news on ABC, CBS, NBC and PBS, as well as the print editions of The New York Times, The Washington Post and Newsweek across the first 60 days of each of the past four presidencies. Because of the limited time frame and considerably smaller number of outlets, the 2017 comparison sample differs from the broader sample of the modern media landscape featured in earlier chapters of this report. For example, while the leadership and character frame constitutes about three-quarters (74%) of the broader sample, it makes up a slightly smaller portion (69%) of the coverage in the over-time comparison sample. Additionally, the overall assessment of Trump and his administration in the comparison sample was more negative and less positive than the broader sample. This is in part because assessments turned less negative as time went on, and the comparison sample has a month’s less data. Still, coverage during this shorter time span was far more negative than positive (62% negative vs. 5% positive). Compared with the first 60 days of the Clinton, Bush and Obama presidencies, news outlets’ evaluations of Trump’s start in office were far more negative and less positive. About six-in-ten news stories about Trump’s first 60 days (62%) carried an overall negative assessment of his words or actions. That is about three times more negative than for Obama (20%) and roughly twice that of Bush and Clinton (28% each). Coverage was also far less positive, with just 5% of stories conveying an overall positive assessment of the president and the administration. This is in sharp contrast to Obama’s first days in 2009, when 42% of the stories offered an overall positive assessment. While the difference is less pronounced, coverage of Bush’s and Clinton’s early days was still at least four times as positive as Trump’s (22% and 27%, respectively). 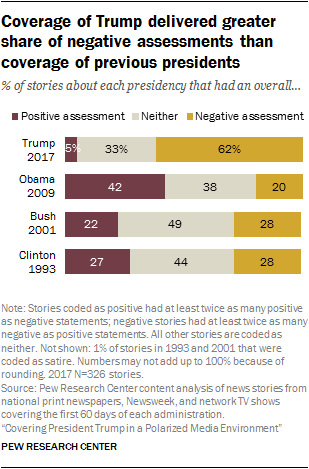 Both Clinton and Bush received more balanced shares of positive and negative coverage (between 22% and 28%), while 44% and 49% of stories respectively had neither a positive nor negative overall assessment. Another major difference between the coverage of Trump’s first days in office and that of his last three predecessors is in the way journalists framed the coverage of the day’s events – whether more around leadership and character or the policy agenda and ideology of the president and new administration. In previous years, the leadership and character frame never comprised more than half of overall coverage.3 In 2017, however, nearly seven-in-ten stories (69%) employed this lens. Coverage focusing on ideology and agenda, on the other hand, dropped from 50% in 2009 (a level lower than previous years) to about a third (31%) in 2017. 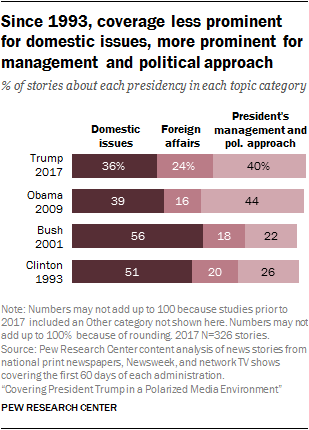 Stories about each president were classified by subject matter into three broad topic categories (which in 2017 overlay 44 more specific topics): domestic issues, foreign affairs and the president’s management and political approach. Each received similar levels of attention during the early days of the current administration and the beginning of the Obama administration in 2009. 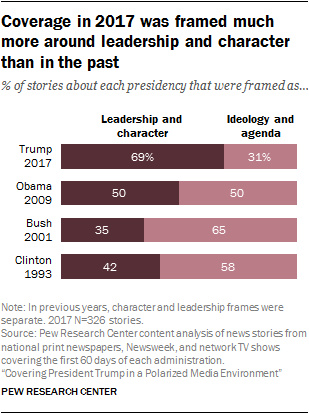 For both presidents, about four-in-ten stories were about their management and political approaches, just slightly higher than stories about domestic issues. Foreign affairs received the least attention in both, though this was slightly higher during Trump’s early days (24%) than Obama’s (16%). In contrast, during the first 60 days of both the Bush and the Clinton administrations, foreign affairs as well as management and political approach were covered much less than domestic issues. As the political issues facing the country change, so too does the coverage of specific topics within each broad topic category. In each of the past three studies, the specific topics of budget and economics together received the most attention (about three-in-ten for the Clinton, Bush and Obama presidencies).4 In 2017, however, these topics constituted just 6% of coverage. Instead, one of the most common topics of the early days of the Trump administration – immigration (14% of stories) – did not account for more than 1% of stories in any of the previous years. And U.S.-Russia relations, which was the topic for one-in-ten stories for Trump, was just 2% of stories for Obama.